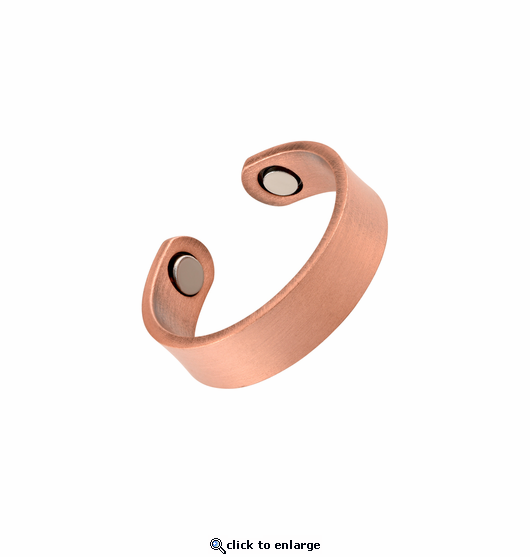 This is an adjustable copper magnetic therapy ring. Styled in brushed copper(not shiny copper), it has a 1500 gauss neodymium rare earth bio north facing magnet on each end. It will fit small to medium finger ring sizes about 6 - 9. These rings have really helped my fingers from hurting. I purchased one several months ago and it really helped so went ahead an bought 2 more. The only problem I have is the space between my knuckle and base of finger are short so they are a little uncomfortable. But that is only my fault NOT magnet jewelry. Definitely worth the money! quick delivery. simple design. easy to polish...use a little fine steel wool. I like it and have bought a few. Wore with hammered bracelet. Noticed reduced pain in hand within a couple of hours. Fast delivery. Good price. Simple design. Fits all fingers except a little too big for my pinky. Looks good on my skin. Definitely will purchase another and recommend to others. Like the ring, but it is small. Need larger size rings. I rate this product a 5. Right from the start I've notice the effects. I will continue to buy more in the near future. Very good quality and I am completely satisfied with my purchase. It looks good and helps with the pain. but because of the open ends, sometimes pinches the finger. I got two rings, one turns the finger black and the other doesn't. I knew of this when I bought them but don't know why one does and one doesn't. Anyway, I bought them for the pain and it helps...thank you. REPLY BY MJS: The discoloration is natural reaction with real copper.